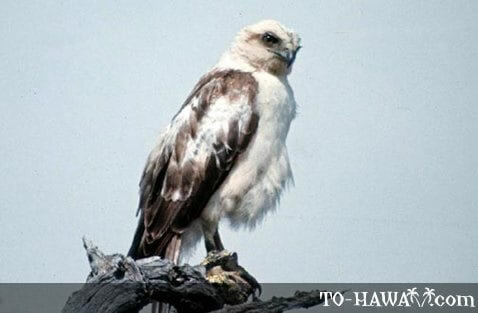 Also known as ‘io in the Hawaiian language, Hawaiian hawks are common on Hawaii’s Big Island, particularly at the Hawaii Volcanoes National Park and in valleys along the Hamakua Coast. They can be seen soaring in updrafts over grasslands and forests. Adult females are larger than adult males. Adult birds have a dark head and yellowish feet and legs. Young birds have a light head and greenish feet and legs. Their diet includes insects, rodents and small birds. In breeding season between one and three light blue eggs are laid in a next built of twigs and leaves in a tree. Usually only one chick is raised. Both parents feed the young and aggressively protect the nest. The ‘io is a symbol of royalty in ancient Hawaiian legends.